Music and Events, A downtown space for lessons, workshops and spoken word events. 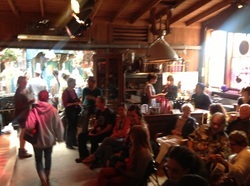 Our small stage is a charming place for your next cultural event. Feeling like a private party is a better fit? We know that the electric vehicle wave has left some boring choices for those of us stylized enough to want to care about such things. Is it wrong? 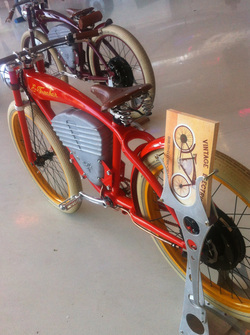 Of course not, it's a natural extension of having fun, retro styling brought to you by Vintage Electric Bicycle. The display of fine aircraft, auto and two wheeled fun wowed the crowd at the Jet Center this evening. Colors as delicious as a dreamsicle with an electric range of 40 miles, top speeds leave many simply scratching spandex in the wake of it's stylish silhouette. As it should be. Nothing lemming like with the retro styled electric creation you see. This little pictorial showcase the E Tracker electric bicycle, debuted this evening at McCall's as a part of the motoring week Pebble Beach. 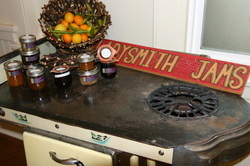 Design cues from an evocative era, hand built and most importantly styled and branded by a local. Fine art as fun. Pickles, Jams and Jellies-Oh my! 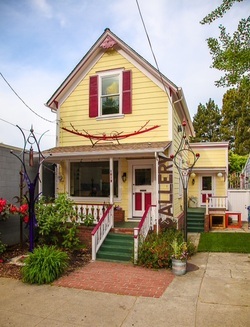 The recent passage of AB1616 whisks in a little fresh air around the cottage food industry. After attending the fancy food show last week in San Francisco the continuing theme there and here amongst foodies is the leveling of the playing field for food centric start up ideas. We've been impressed with the local food artisans we've met and discussed educational opportunities that will be a great spring line up for us. The biggest question from food artisans embracing this recent change is how and what do I need to get started. We'll have a workshop covering the basics of AB1616 a little later this month. Stay tuned and we'll keep you posted with a new delicious list of educational food components coming later this week. 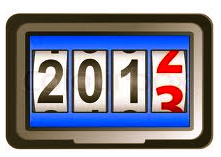 Happy New Year : We'll be dark thru February 1st. The idea of moving was a tough tackle. The new space and new face of dujour will be a sweet addition to the community. We have a shift in our focus as the art gallery and art sale piece of our business retires. If blue chip portfolios were stronger and we had a magic wand, but I digress. 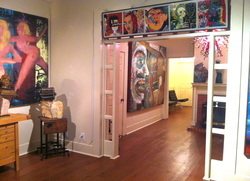 Fazing out dedicated gallery space and utilizing that space for events, workshops and groups better serves our purpose. This action gives the organization a shift in talent and time spent curating to pursue the event driven side of the art community and sponsorship lead art experiences. Outside educational classes from a range of great artist, educators and special projects will be posted here. Think local art portal. A one stop calendar and ability to book multiple classes and workshops all in one locale on-line hook up. Isn't having more choices in one spot really what we all need to make our New Year Resolutions come true? Of course you'll follow thru, how else can we re-invent ourselves if we don't have a macro-local view. The new calendar will be up soon and the offerings for 2013 will be a broad brush view of all things artistically dialed. Current classes already booked will still be held at our Cedar st space . Happy New Year! The past year and a half gave us roots in the community, we love the current space at 1013 Cedar but we see changes afoot with our scope and scale. 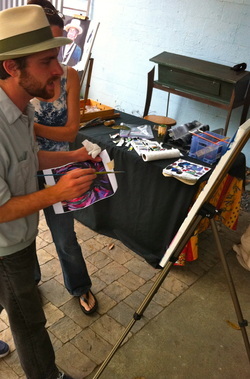 Events and underwriting community art gives us a deeper satisfaction and less brick and mortar to carry. The new year will bring us a great space to create in, and changes to our overall look and feel. Stay tuned. The current space on Cedar Street will be dark for the month of January. Happy Holidays! Our Etsy Trunkshow is sure to rock the 831 with the sheer scope of fun and functional art. How can you say no to wearable art? Join us next Thursday for a sneak peek.. December 6th will be our early invite before the frenzy of First Friday on December 7th. The next holiday cocktail party you attend please pay heed to the mountain of recycling left in the wake of the festivities. We hope the hostess admits that she's in need of some extraordinary help in shlepping the empty wine bottles to the curb. Instead think of dishes, platters and objects d'art all from the curbside blue bin. The late Boyce Lundstrom needs no introduction to the glass artists of the world. I've spent some time in his glass studio in the last few months, and each time the theory was the same- reinvent something that's worthy of our attention. Recycling is high on the radar screen. Fusing glass in a giant kiln is fun and melting just to see what happens needs to be shared or maybe even created for a functional place in your kitchen. The most recent book by Boyce really will whet your appetite for everyday glass recycling. Try looking at any colored bottle or glass container with the same throw-way mentality. Art du Jour has developed an amazing series of classes around the ideas based in Boyce Lundstroms' Best Bottle Book Ever. Bottles fused into a new art arena. Instead of glizy dicrochics the palette is much more subdued, yet equally beautiful in it's depth of color and range. More importantly- it's an old wine bottle. If this world needs less stuff, and we can create a line of dishes, functional art for the home all from pre-exsisting landfill glass, why wouldn't we at least have some fun with a tile saw and a kiln. Then serve popcorn or chips in your fused glass object of art at next Sunday's afternoon gathering. So who's smart and saving the world from becoming one big land fill? The glass studio is currently offering it's new recycled glass classes and workshops with the help and expertise of sculpture/glass blower Kitty Mathieson. It's a great feeling to recreate using recycled goods- please join us! Next recycling class is this week. Please call 831-621-0672 to save a spot, or register and pay on-line under classes. We've got some fantastic new artglass jewelry that will grace our upcoming Etsy Trunkshow. This December gallery show will be an amazing mix of fine art and jewelry. Save the date of Thursday, December 6th from 5:30-8:30 p.m. for a special preview sale and cocktail event. Stay tuned you artistic superstar. We've got great classes coming up for the new year. The exciting news is a new class list of offerings centric to artistic welding, and glass blowing. Local glass artist Chris Johnson has built an amazing facility, and Art duJour is proud to offer classes for 2013 which will be taught by local women artists for women. Think kinder gentler art experience, with fire and sparks. Does this speak to you? Please email us to be on our preferred list, as the initial classes will be limited to six students. Stay tuned for dates and details. Sweet scene in the garden studio here at duJour. 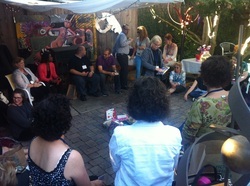 The level of fun for the reader crowd hosted here was described as fantastically dialed in to all things book centric. The Booktopia event was a book-groupie (I resemble that statement) group of readers, from all over the USA landing here in our zip code and enjoying the best of our fall season. Lucky ducks. The glue that stuck this event together is a podcast which serves as the what to read, and what should be on your short list for all things book. We so enjoyed this lovely event. We hope you book-lovin' well-traveled visitors to Art duJour had as much fun as we did. Safe travels. Marc Gould: Held Over For Nov. Gould gets our vote for creative sway of the non-partisan. October in all it's splendor. Sign Up Now for Pet and People Portraiture with Artist Noah Gould Work with oils and enjoy the brilliance of Portrait Painter Noah Gould. Saturdays from 11-2 pm in October throughout the year. Ages 12 and up. All levels encouraged and welcome. Fee for 4 classes: $135+ materials. Register here. Out'a town for 1 or 2 classes? No problema! Classes may be taken non-consecutively within the summer, fall and spring semesters. List of materials: One 14 x 18 canvas (nothing larger than 18 x 24). Paint: Payne's gray, blue, red, yellow, white, sienna, burnt umber. Optional Paint: Premixed tertiary colors in warms and cools. Medium brushes: small round #1-6, large bright #10-16, mid range filberts #4-7, small fan brush. Pencil and eraser. Liquin. Pallet or pad. Graphite powder. One 81/2 x 11 color image and one black and white image to scale of your canvas. The political season is here, and just like the scaryiess that lurks around the corner with Halloween, the scarier is this great piece of mixed media art by our resident artist Steven Addi of Artscape Productions. The voting season nipping at our heels, we feel strongly about making the issues around GMO's top of mind. Marc Gould, and the beauty of all things creative. It's a big weekend for art. We encourage you to seek out open studio's this weekend and next. Nice weather and an outdoor venue completed the scene last night. 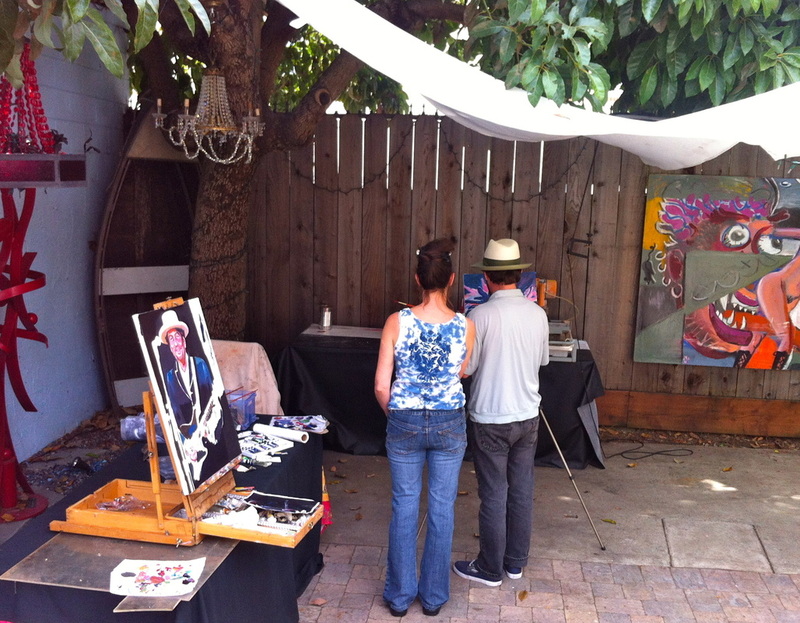 Indoors and out, the scale, scope of talent with a dynamic Gould Family ARTENEMYS garden studio painting at Art duJour made for a dynamically dialed First Friday. 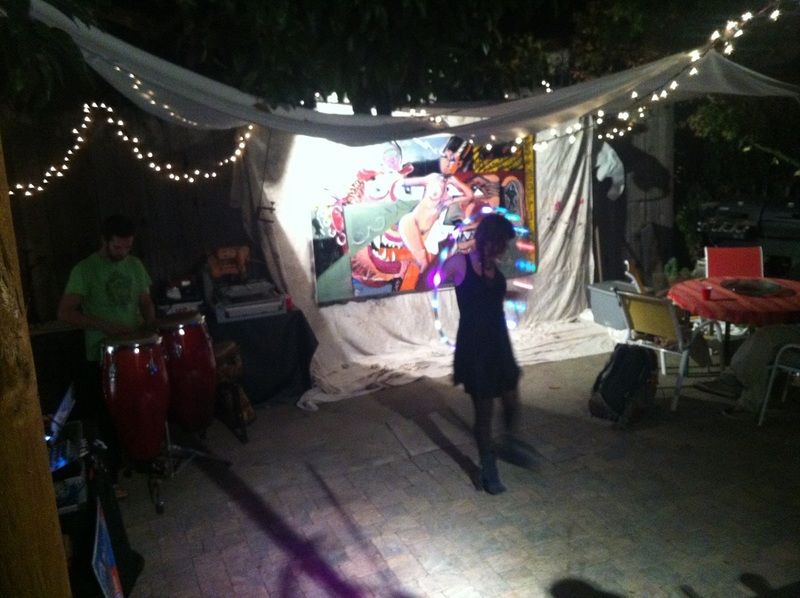 Great Music and Alfresco Art. Brava, to the beauty who brought her lite-up huluhoop. 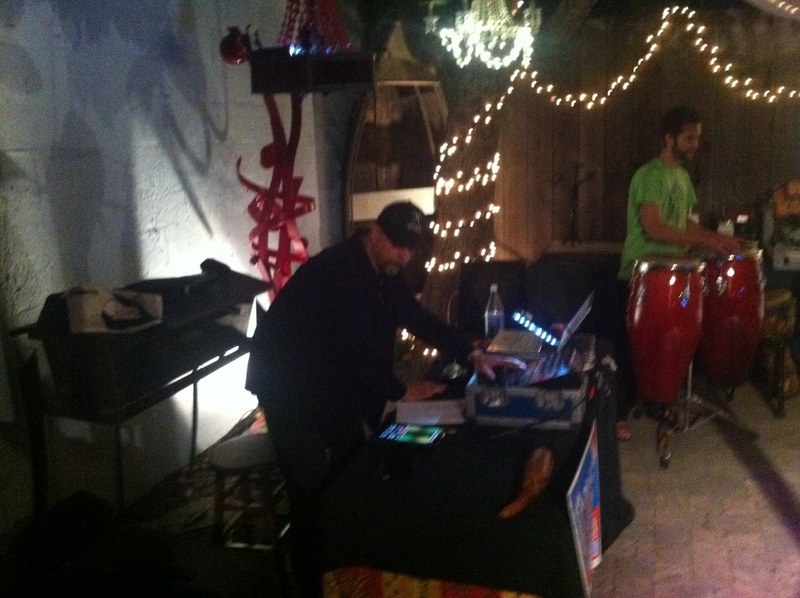 Big fun, and big sounds from Steven Addi and his Electric Space Opera a lovely evening event. Thank-you all that attended! 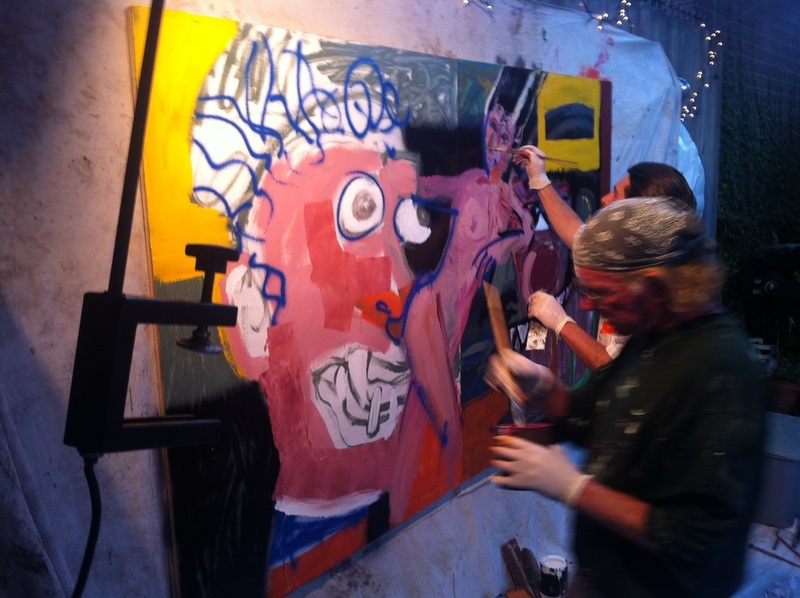 ARTENEMEYS New work, large canvas=big fun. The work of Marc and son Noah Gould is of such fun. See you this evening as our First Friday kicks off at 5 p.m.
Don't forget it's open studios too... so much fantastic creative energy in the 831. 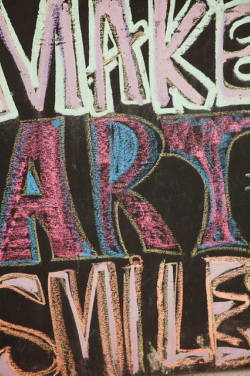 Treat yourself to the best and brightest of the local art scene. This year they've embraced technology with a smart phone app, for those looking for the analog version, the cost of the calendar goes to a great cause. 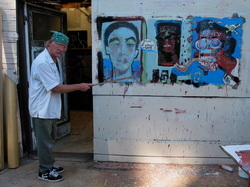 Marc Gould is well known for his work on large canvas. Art duJour welcomes the upcoming exhibit for First Friday, featuring his sculpture. 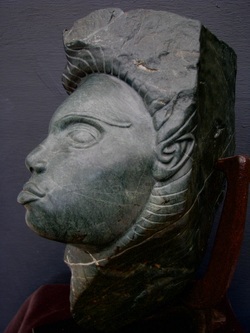 Altered Rocks: Artist Marc Gould / assemblage / carved stone sculpture. Altered Rocks is richly imaginative and highly charged with personal complexity. Good sculpture provides us with surface interest, but great sculpture penetrates …Altered Rocks is a pitch perfect balance of Marc Goulds’ creative genius. We would be remiss to not share the fun and excitement around New Art Enemys pieces by Noah and Marc.. so you can expect double the amount of talent+ fun.. Introducing The cosmic sounds of Electric Space Orchestra in the garden at 8 p.m. with the introduction of ART CAN, presented by Artist Steven Addi. 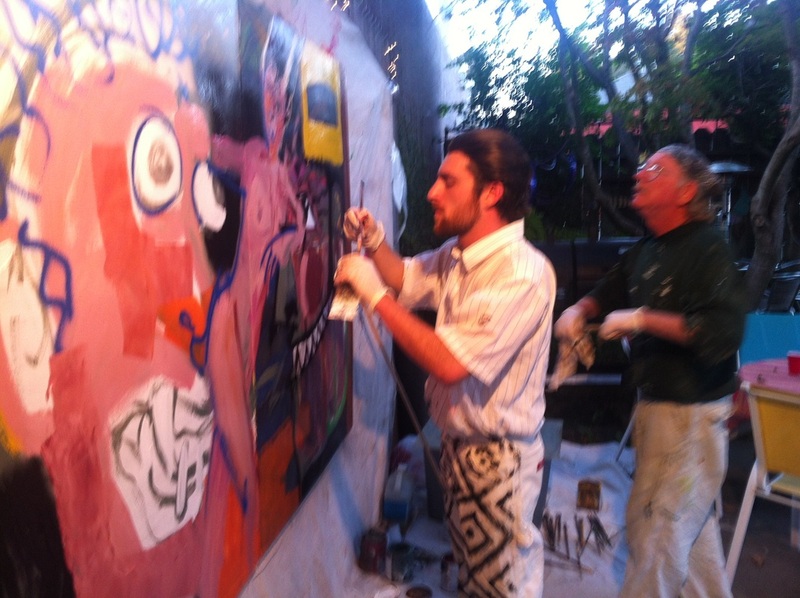 Mix it up with the LIVE ACTION painting of Art Enemys Noah and Marc Gould. The joy of reading to your child is only surpassed when your child points out that this will be the next to the last page this evening so as not to disappoint his listener(me!) The listener in me has a soft spot for the spoken word. The podcast world was made for people to seek out that singular socket to plug into. No voice is less interesting than the next subjectively speaking plus the sheer number of stories, funny bites from everyday, and the fan fare for people to make a fuss. Does not mater what the fuss. Simply having the action occur -Embrace the podcast as the modern day app for being heard on a larger scale. Hint hint: hey local elections, how about the local soapbox in podcast form? Pod casting pushes our collective creative genius. Bring the voice, any voice:ideas on theme and content then email us. We will discuss what we get/or not receive if that's the case. Nice if it were community related, but give it go with what ever's at hand. Stay Tuned.... Pod casting comes to the studio next week with a dry run session or two and a kick off of the amazingly talented but somewhat secretive Steven Addi. 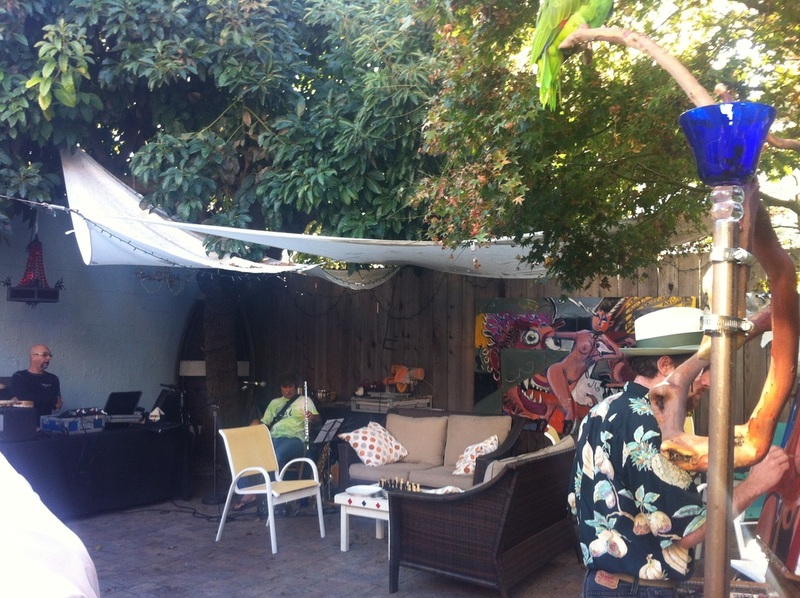 His musically wired side makes an appearance here at the studio garden space Wednesday evening September 19. Looks like an invite would be too strong, but if you're downtown Santa Cruz tomorrow evening ( Wednesday 9/19) C'mon by. The Fall Activity Guide classes opened today for registration. These classes are widely popular as you can imagine. They fill typically in the first few days (we've been excited about that part!) But should you find the fused glass offerings full-fear not. We have another batch of glass classes that are on line. Seeking a spot to call your own with friends or the relative quiet of our little studio sanctuary with the kiln at your disposal. This could mean a private session or series of studio classes tailored to your schedule and creative-educational needs. Email us or ring the studio, 831-621-0672 with a few dates and we'll see what works. Events around a glass project is a big hit with all ages, and attendees take home fantastic art. Tomorrow evening promises a mix of fun, art, music and a great way to support a global effort that has roots here in Santa Cruz. Bearing witness to a creative endeavor. The past few weeks of our late summer afternoons have been filed with teen and t'ween aged glass artists. As a parent of a tween I can share with you what you might already experience should you have an inhabitant yourself- getting this age group excited about anything let alone an art class might be as difficult as middle east negotiations. Yet when tools, glass and materials appear the fantastic transformative experience is pretty powerful. Perhaps the most powerful part of the process is then witnessing the wonder upon the faces of these young artists as they rediscover the newly fired creation... Magical really. When I opened the kiln this morning, the friendly warm blast of air greeted me along with a sea of jewel like creations as this past class was focused upon small creations of various shapes and sizes. The teenage creative push the evening before had placed these tiny artworks carefully into the kiln, and the fused projects were nothing short of spectacular. If you have a teen or tween that needs an after school diversion or new sense of direction we urge you to consider our fusing classes. That said, welcome to our WOW! Wednesdays...an opportunity to experience this magical medium of glass art. The experience will either wow 'em ( although as teens they will mask the excitement) but the introduction will have been made and as parents looking for quality learning experiences, this is unparalleled. Plus Heather sets the educational stage with the theory of fusing and the science of glass mixed in for fun. 5:30-7:30 drop in Wednesday will be available to first time duJour students for $35.00 plus materials. This includes one kiln firing and one slumping session ( a value of $70.00!) If you would like to join along you are welcome to do so. We have the garden studio set up as well so c'mon and join us... you'll have fun, learn a new medium and perhaps discover a passion for this great form of artistic expression. You like this, the next step might be our full intro series. "Art is the only way to run away without leaving home. " The collective sigh... School is back in full swing. Ring a ding ding! This holiday weekend might be the time to etch out a little free time for you and your back burner projects. 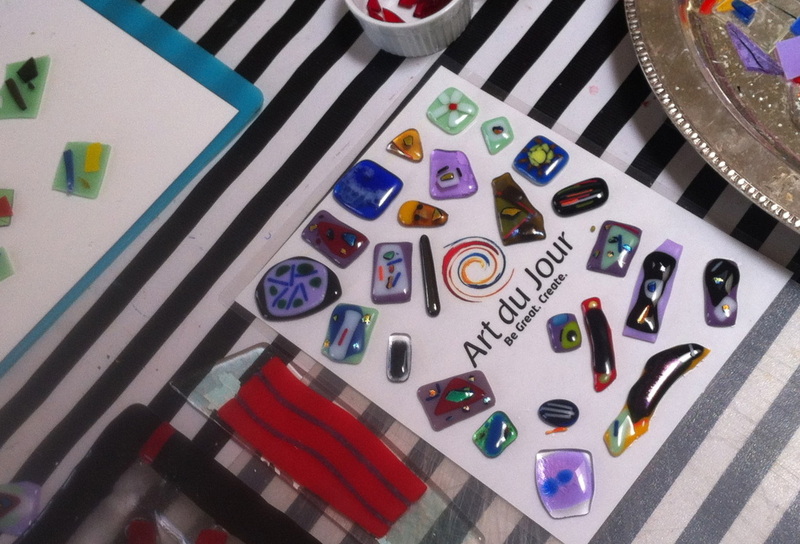 Our glass fusing classes have a great vibe for the creative genius in all of us (okay the 99%) but for those of us seeking a way to unplug from the mundane, there may be no better medium than a glass class at duJour. You can quote us if you'd like...nice to have a fall back excuse to escape with a class for a few hours and rediscover your creative you. The fall schedule is fantastically full. We invite you to come and experience a great way to creatively re-charge. Classes have filled quickly, so be safe and secure a space on-line. Happy Humpday. Have a great holiday weekend. Our Teen and T'ween Gass Artists Work. Fall Fusing Schedule is Here! The school season is back in full swing for most of the 831. 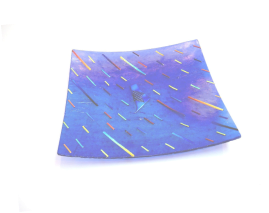 We welcome fall sign-ups for the new offerings in fused glass education. Just a reminder, if you can't find a fit with the current offerings we can create a class with four students. The new Wednesday drop-in class is a fun new addition- a very nice opportunity to try your hand in a new medium without the commitment of a class schedule.